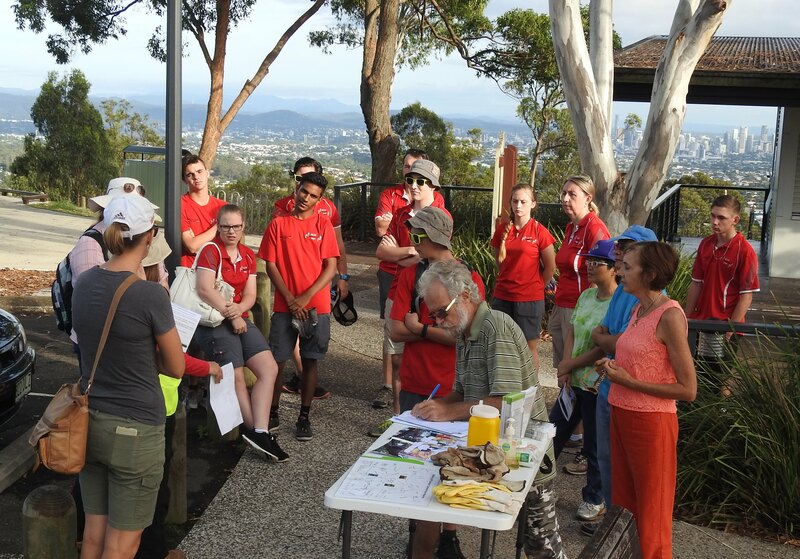 Meeting at Mt Gravatt Campus the Griffith Mates team introduced students from Germany, South America, China and Japan all keen to learn more about the Australian bush. 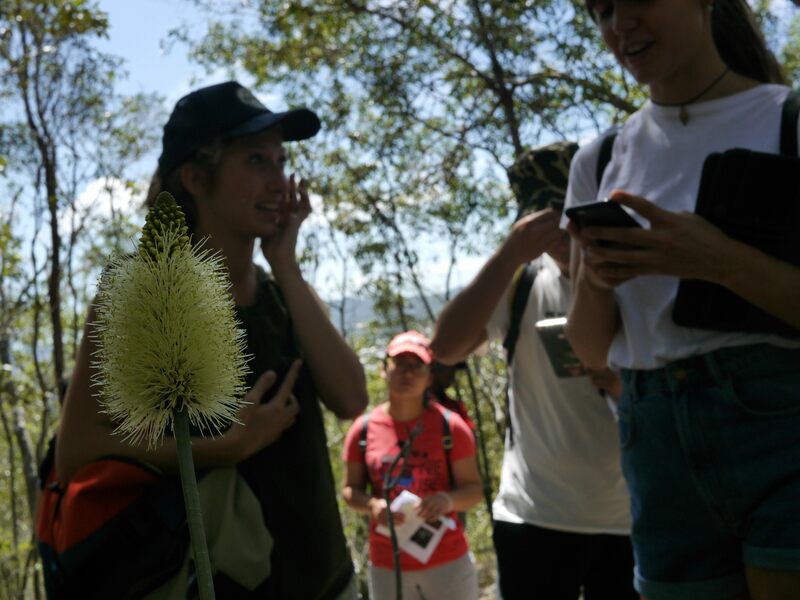 The students were very interested in learning about our native ground orchids: Slender Hyacinth Orchid Dipodium variegatum. 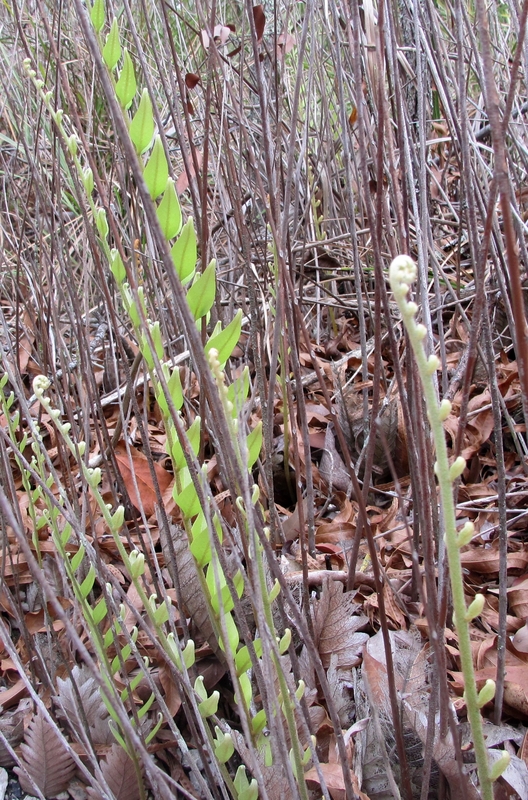 I explained that, lacking any leaves, these orchids are critically dependent on their relationship with fungi in the ground. 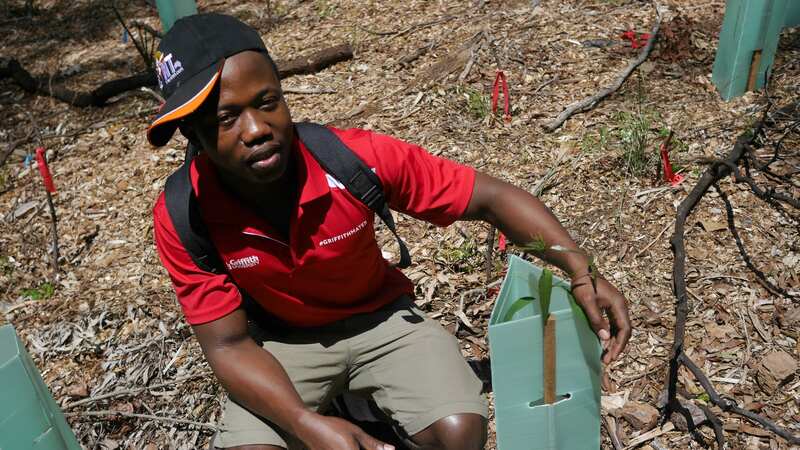 The fungi mycorrhiza, fine root like fibres, feed the underground orchid with organic carbon and minerals collected from roots of adjacent trees. 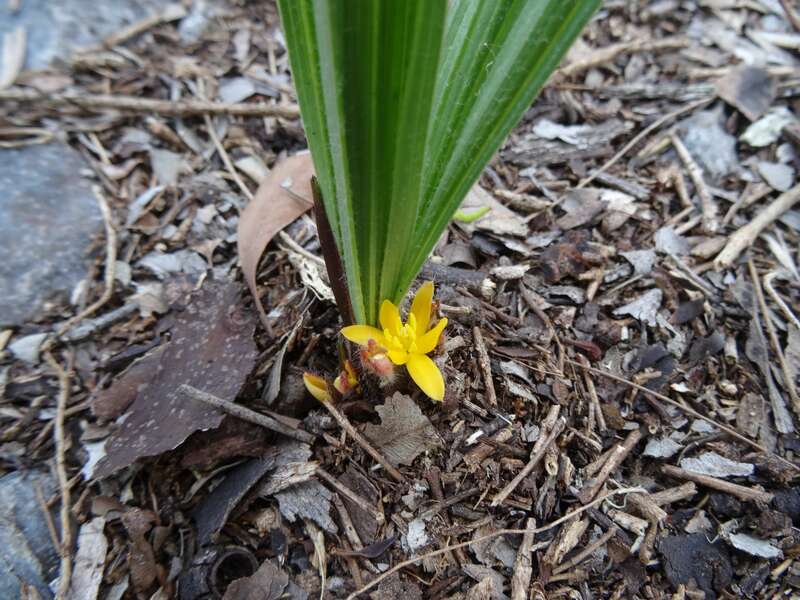 These native orchids cannot survive if removed from the bush as they are totally dependent on their relationship with the fungi. 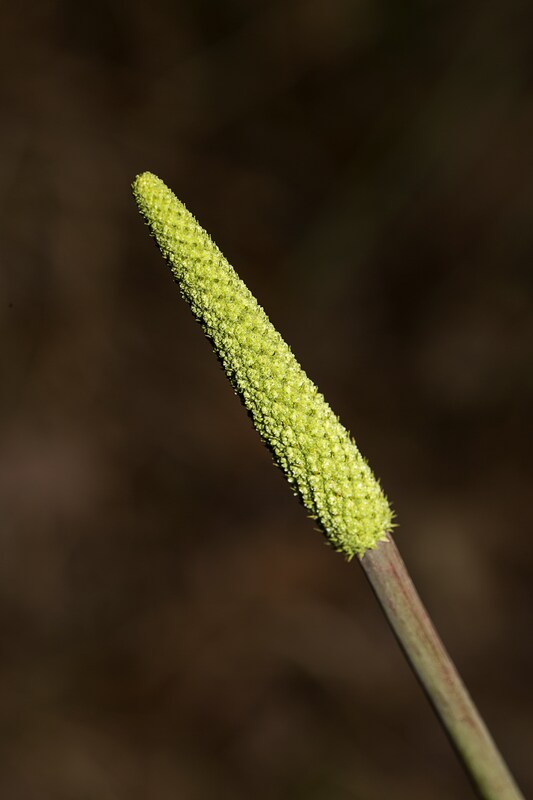 Along Acacia Way we looked at the unusual Bottle Brush Grass Trees Xanthorrhoea macronema in flower. 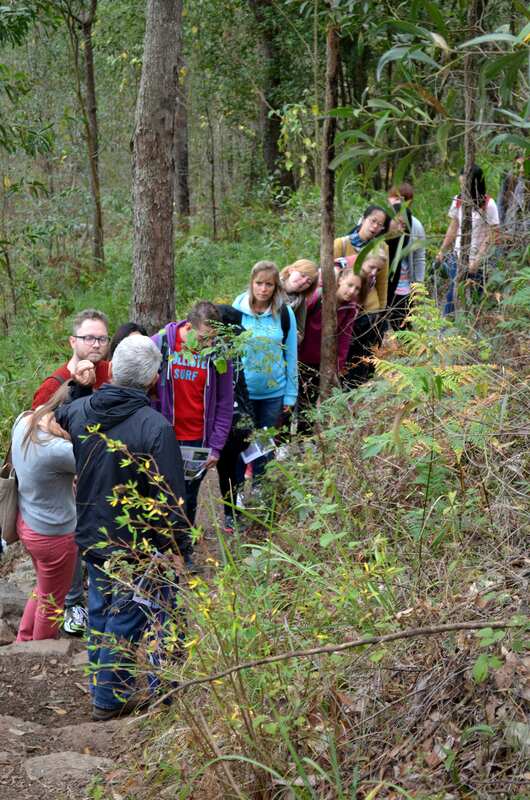 Looking closely we found Stingless Native Bees (Tetragonula sp.) 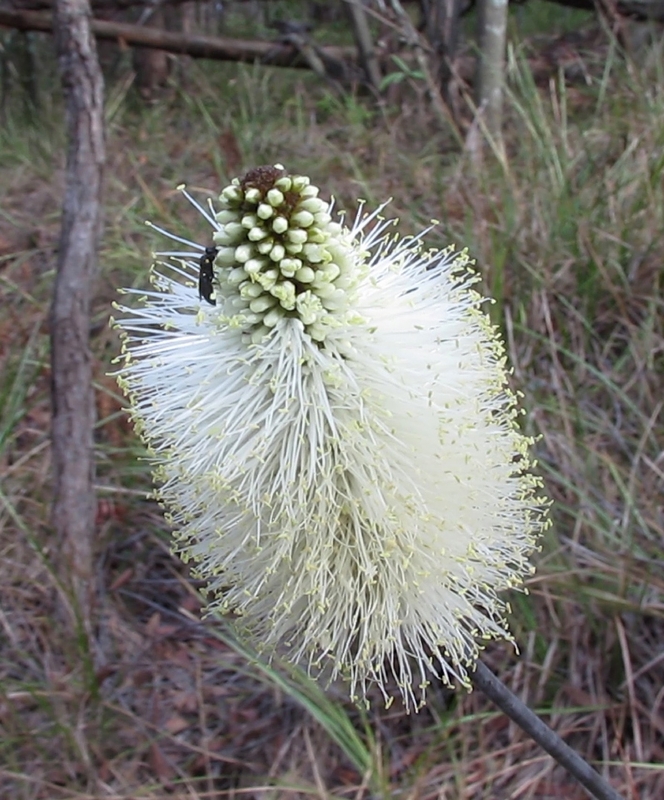 collecting pollen and nectar. 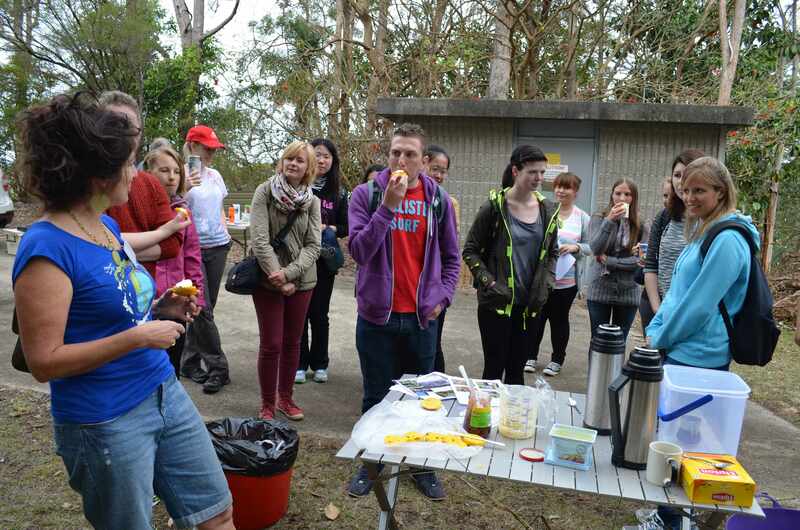 Bird song is an important part of any walk in the Reserve. 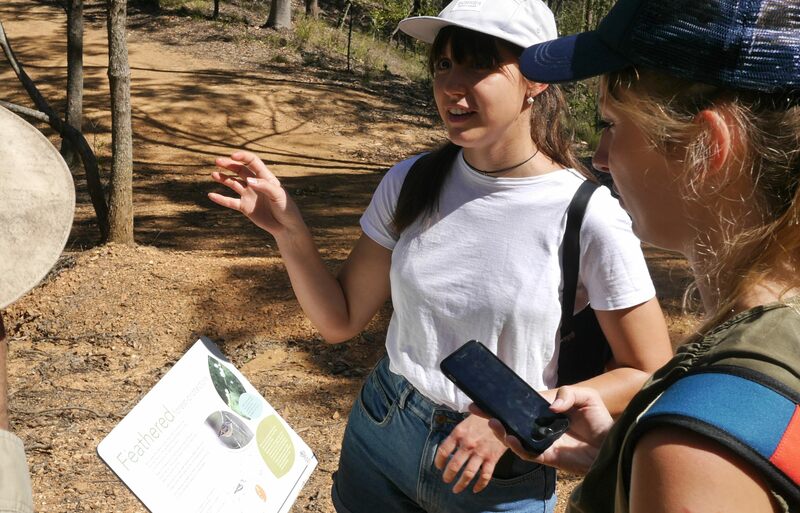 The QR code on the Pardalote interpretative sign linked to a video of a Striated Pardalote Pardalotus striatus singing. 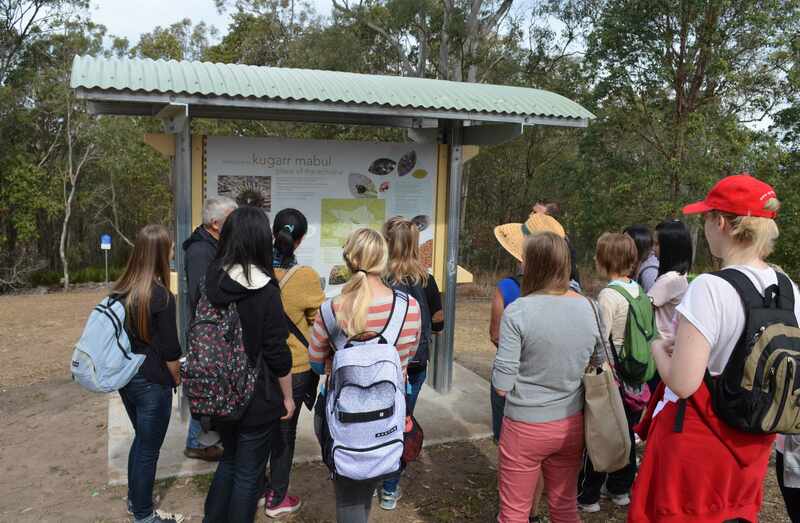 I introduced the group to the iconic and cheerful song of the Laughing Kookaburras Dacelo novaeguineae. 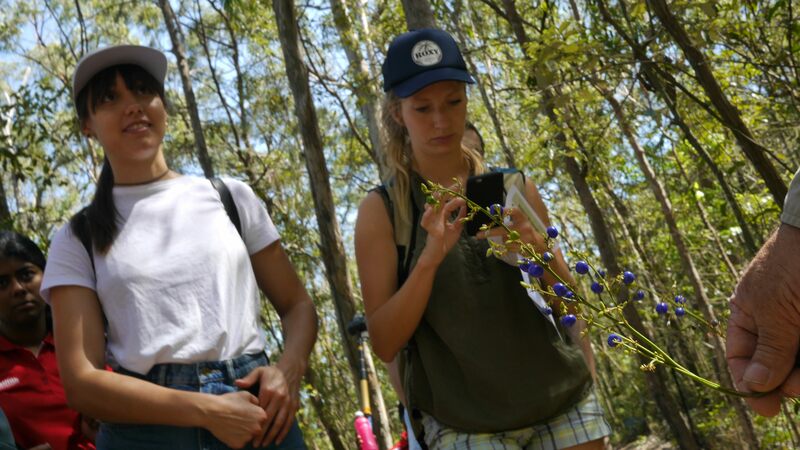 Along Acacia Way we found Settlers Flax Gymnostachys anceps: used by early settlers to sew bags and indigenous people combined it with bark to make fishing line, Blueberry Lily Dianella longifolia and Native Raspberry Rubus moluccanus. 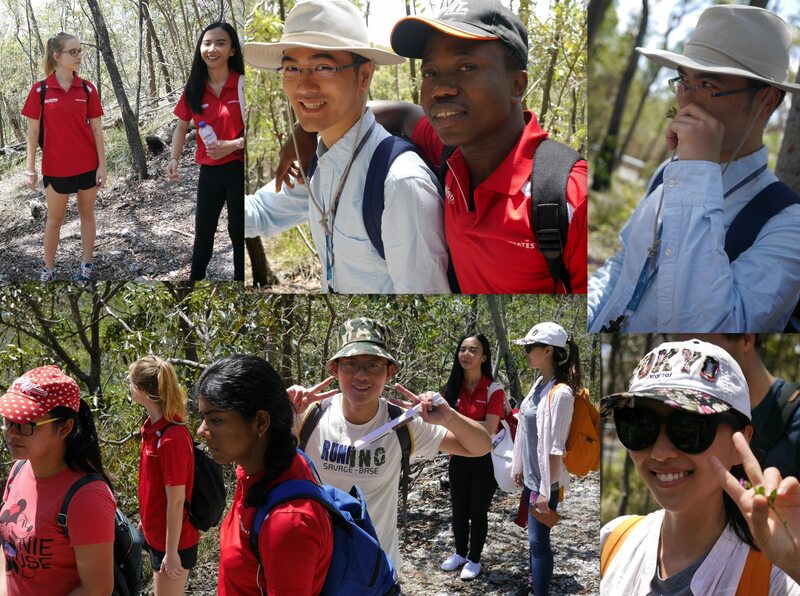 Leading guided walks with Griffith Mates is always a pleasure … lots of smiles and laughter along the Eastern Outlook Track. 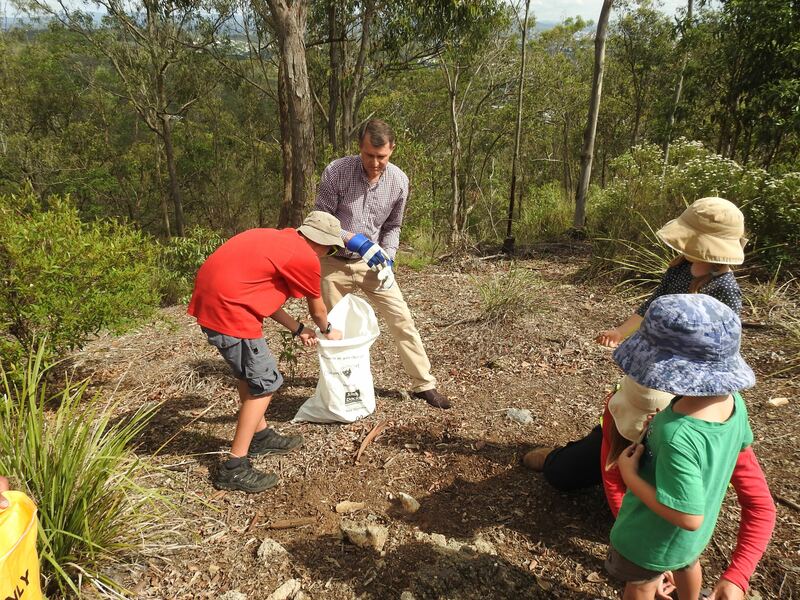 A quick stop to inspect results from the 2016 National Tree Day planting: thickening nicely and some trees over 3 metres. 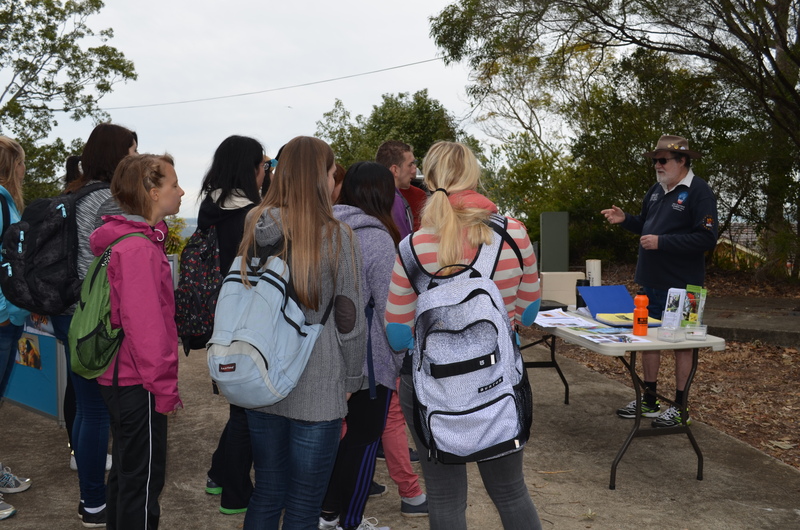 Last stop was the 2017 National Tree Day site. 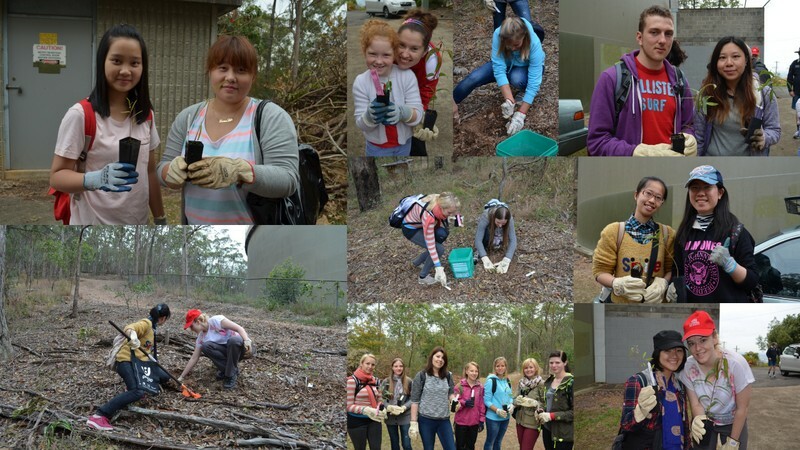 I showed the natural regeneration in the area where the invasive weed Creeping Lantana Lantana montevidenses was cleared as part of National Tree Day. 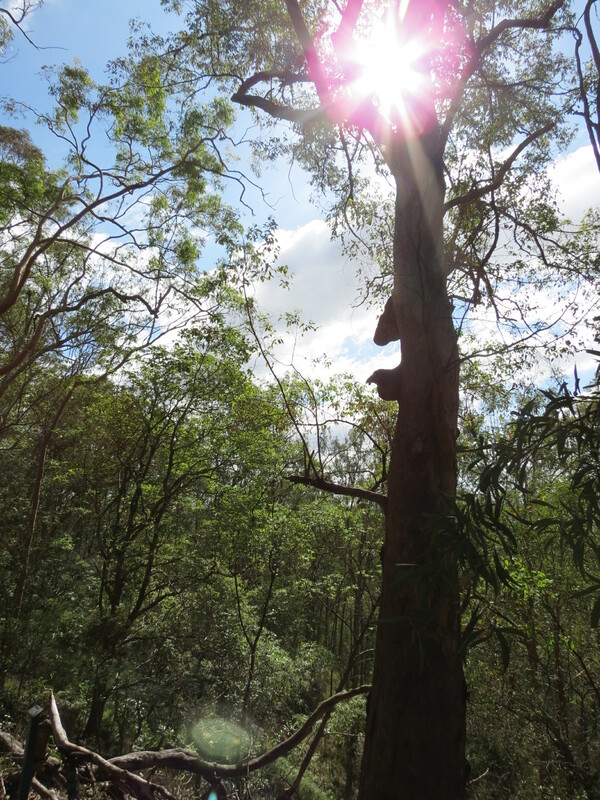 Nature is very resilient if we give it a chance and the returning natives are strong evidence of the effectiveness of our Bushcare work. 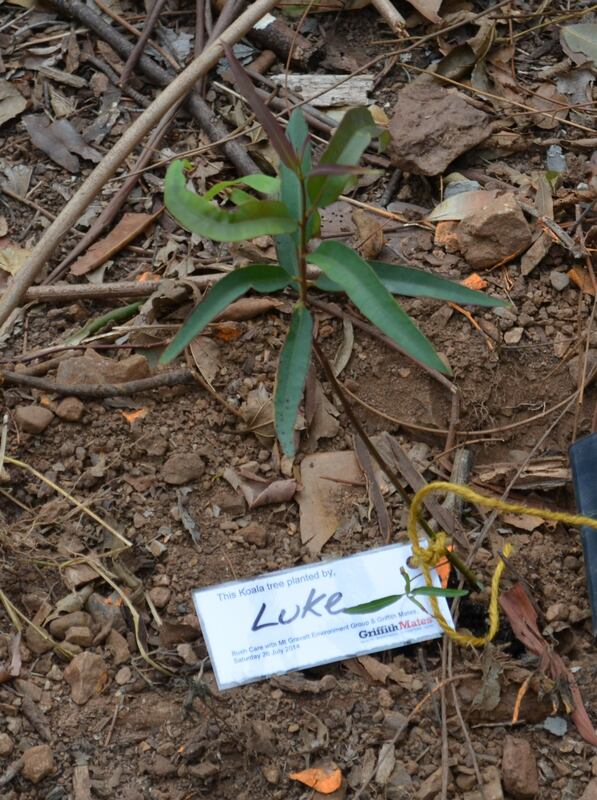 Vincent took the opportunity to check in on the tree he planted on National Tree Day. 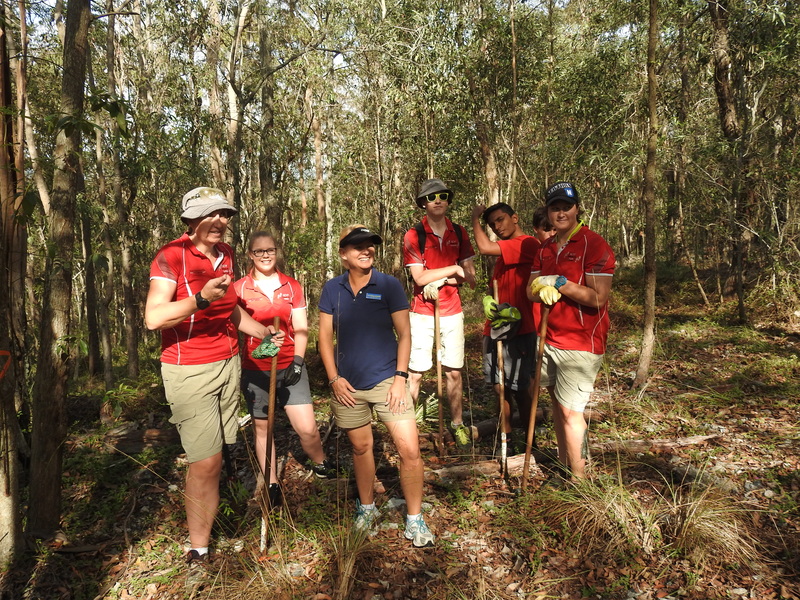 A great walk … everyone seemed to be inspired to return and help with our Bushcare work. 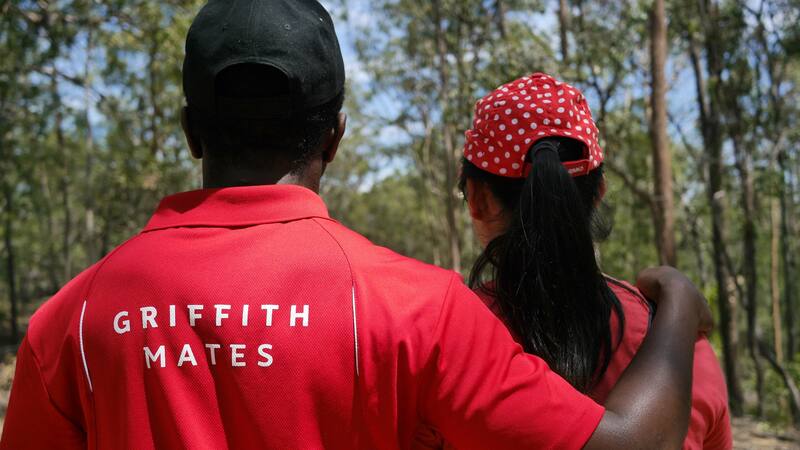 Thanks to Andreas Listle for staying behind the camera and capturing memories. 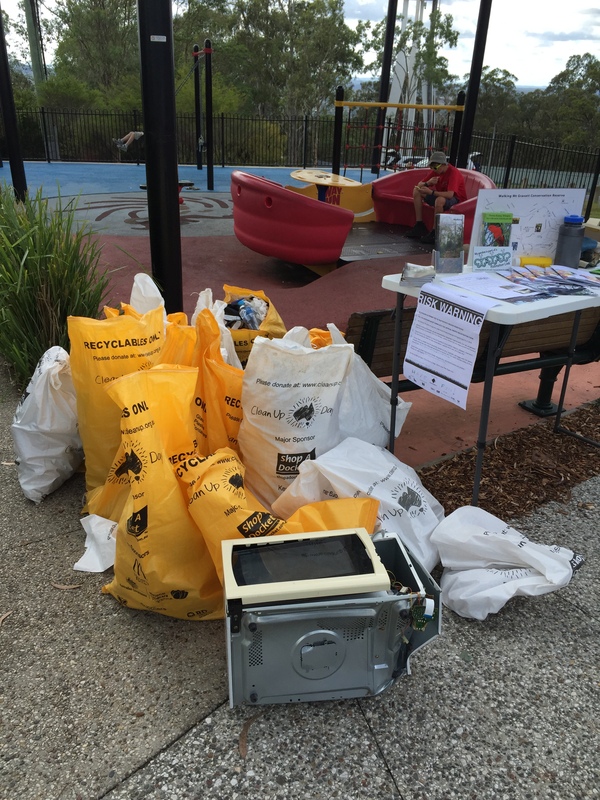 Fox Gully neighbours Miranda, Scott and children, Freya and Clementine, had a special wildlife experience today. 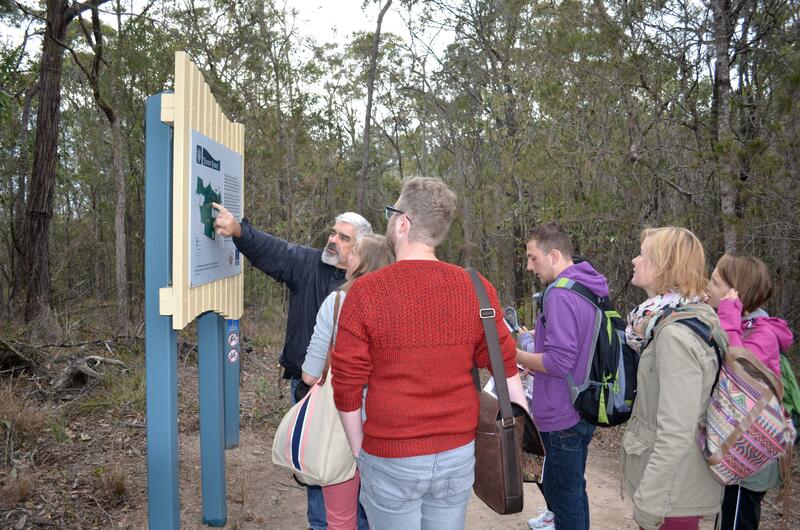 Walking the Geebung Track just near the National Tree Day planting site the family spotted a Koala Phascolarctos cinereus on the ground beside a tree. 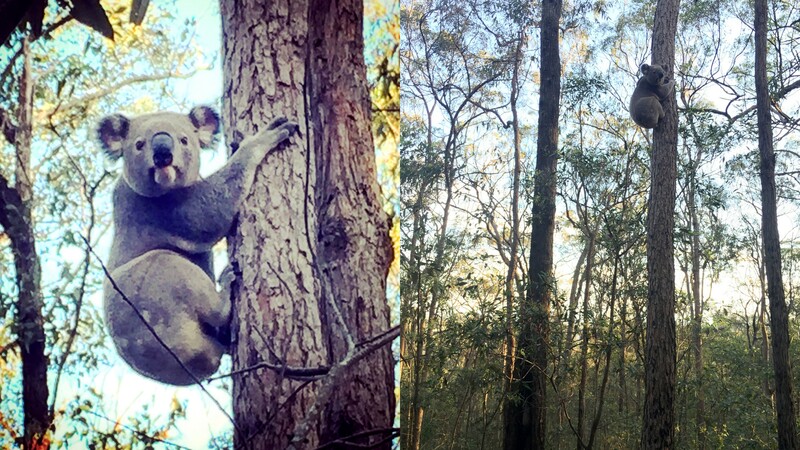 They managed to get a special photo of the Koala reaching up to climb a tree. 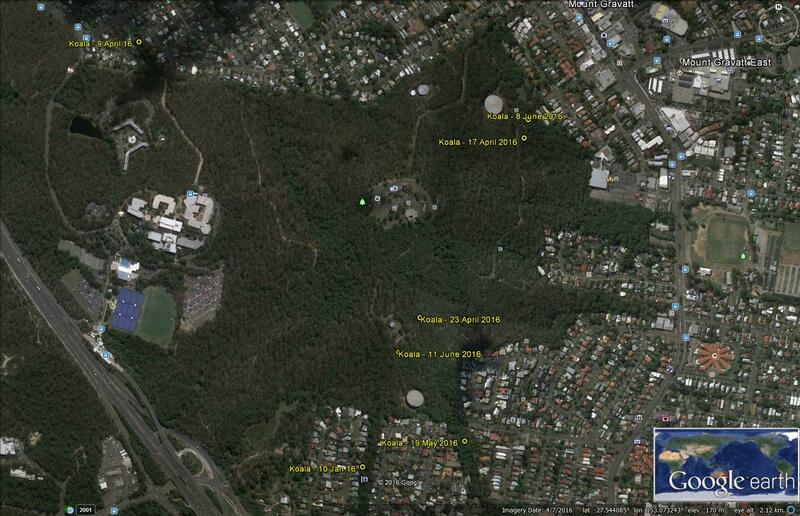 The family’s sighting has been added to Koala Tracker and our Google Earth map of wildlife sightings. 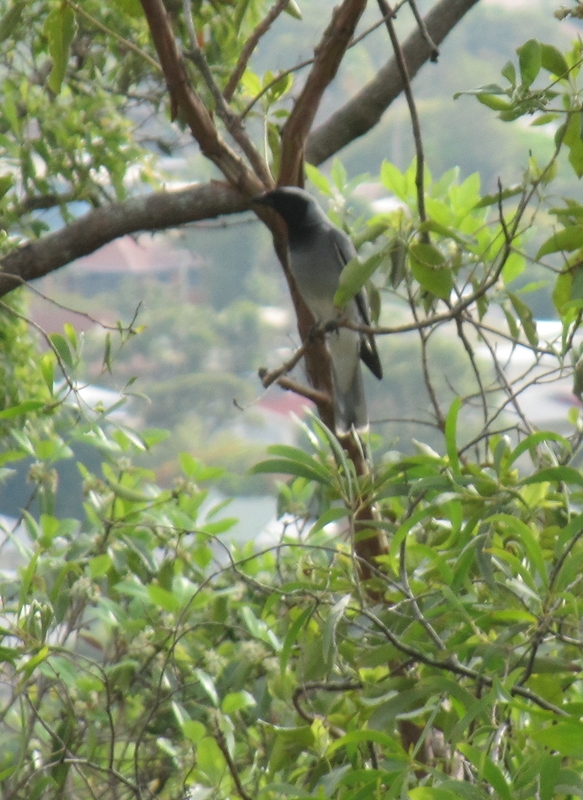 He (or she) was in a large Tallowwood between public housing at 59 Gosford Street and footpath from Gertrude Petty Place to Federation Outlook this afternoon. Was quite high up so this is the best I could do with my Iphone. 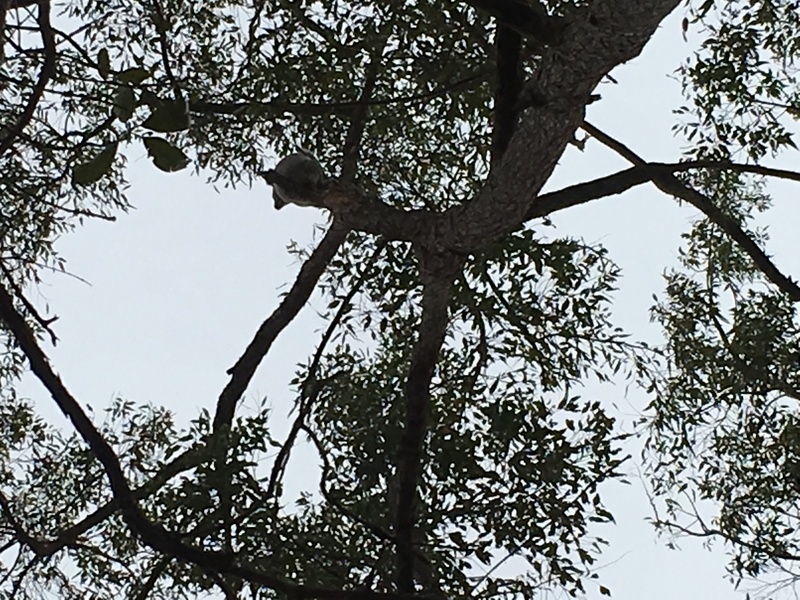 Also two quite large microbats patrolling GPP at 5.15pm tonight. 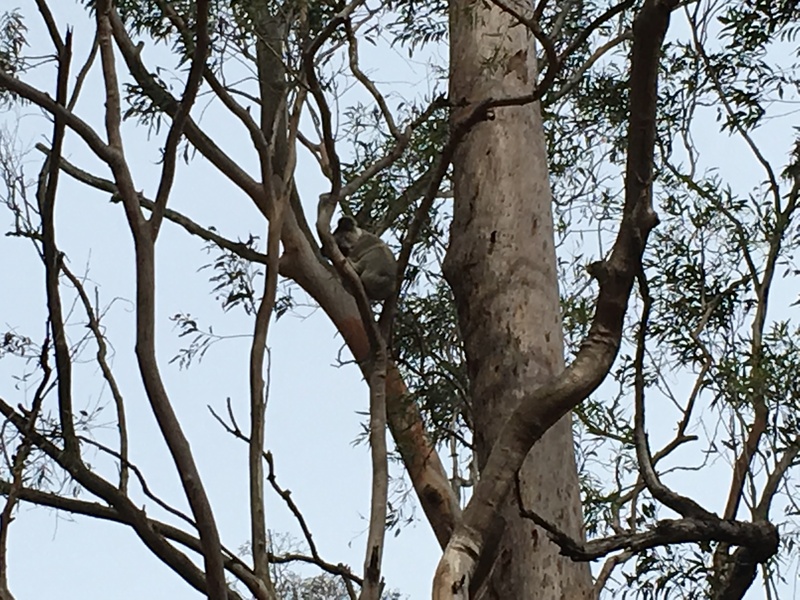 Our Griffith Mates bushcare partners were very happy to find a Koala beside the Federation Track heading down to Granby Street. 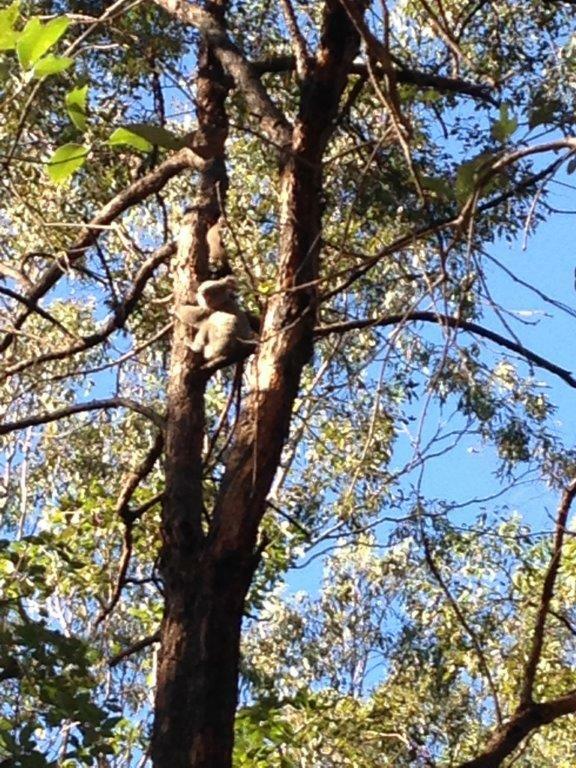 We are sighting a koala bear for last two weeks, during a trek to Mount Gravatt lookout. 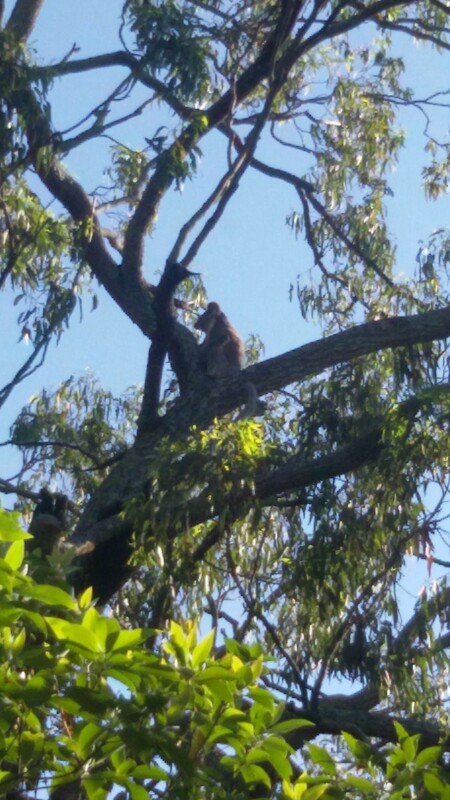 Today, we sighted them on top of a eucalyptus tree 100m from carpark near Logan Road entry. 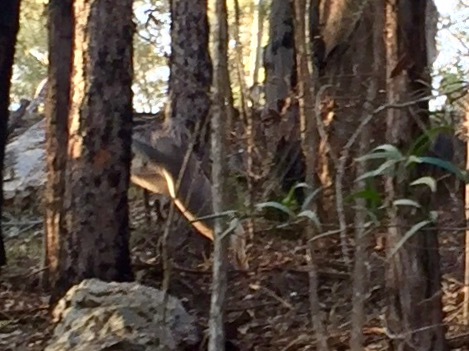 Last week, sighted them near Federation lookout. 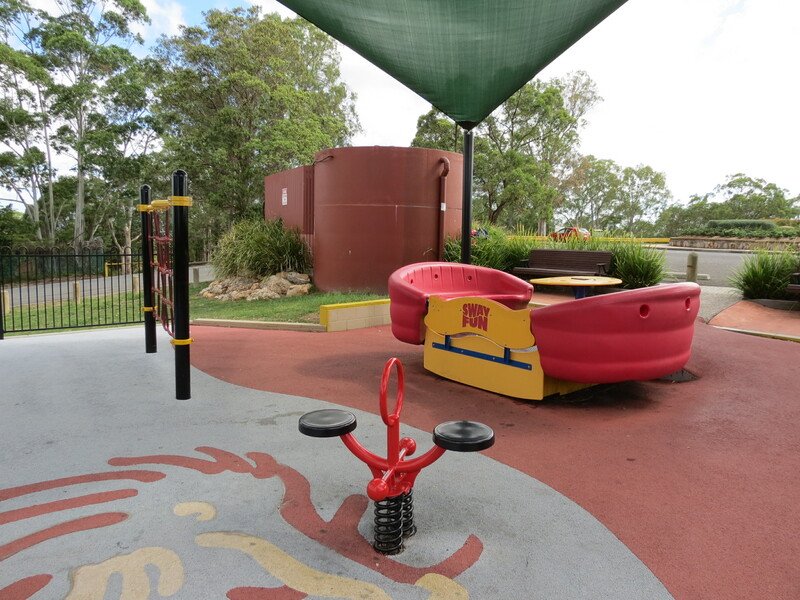 Attaching pictures of the same to inform respective authority. 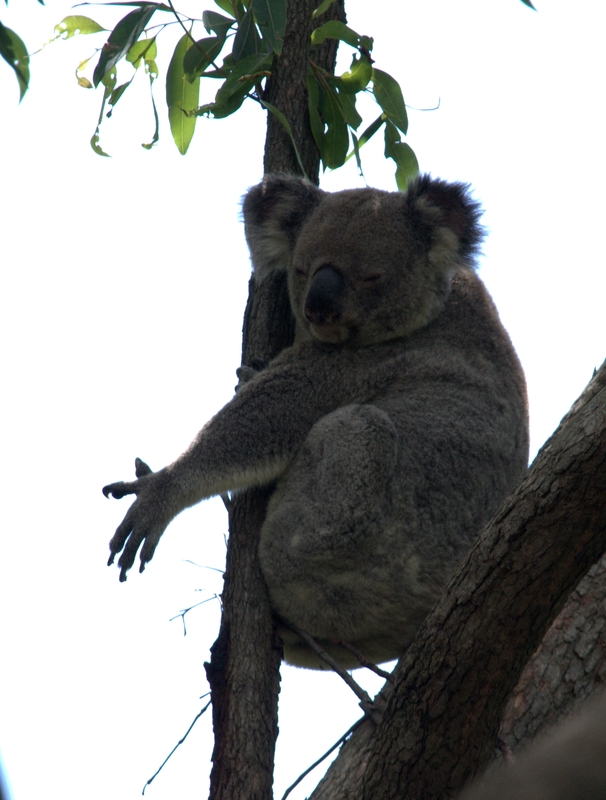 Maria, Matt and their children often find Koalas in the trees right behind their house. 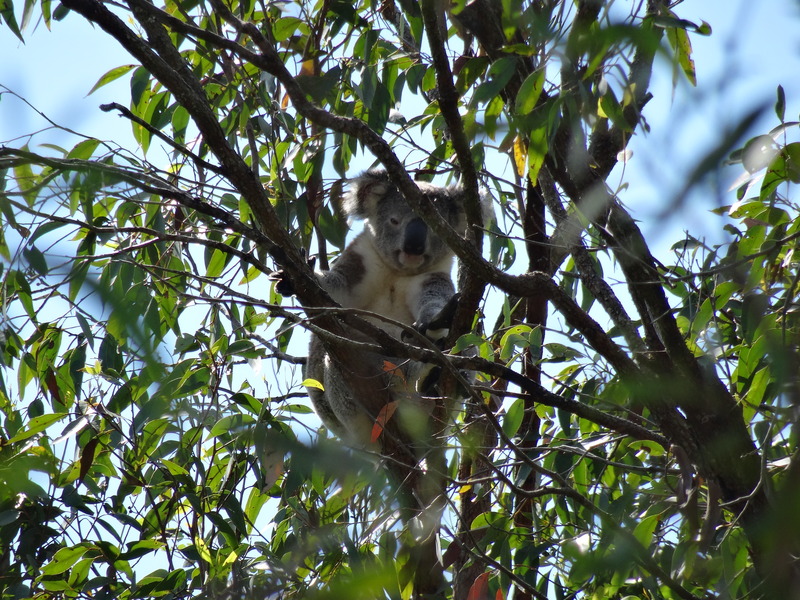 In January 2013 the family had a Koala mum and joey visiting. 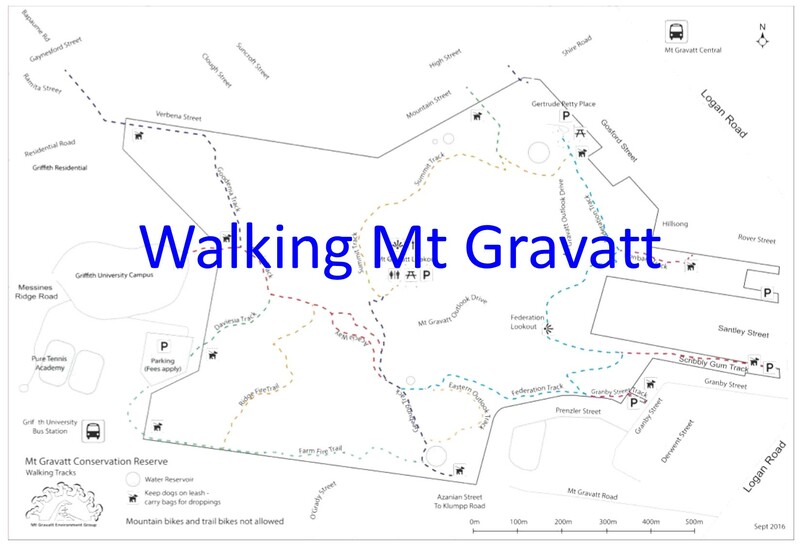 Part of preparing an accurate and useful map/walking guide for Mt Gravatt Conservation Reserve is actually walking all the tracks to check times and signs. 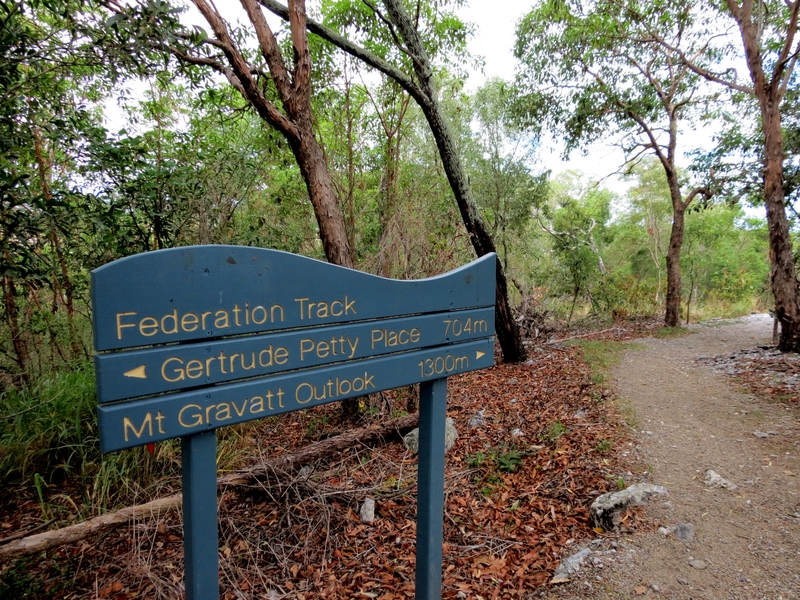 This week I walked the Mt Gravatt Lookout Look starting at Gertrude Petty Place I followed the Federation Track. 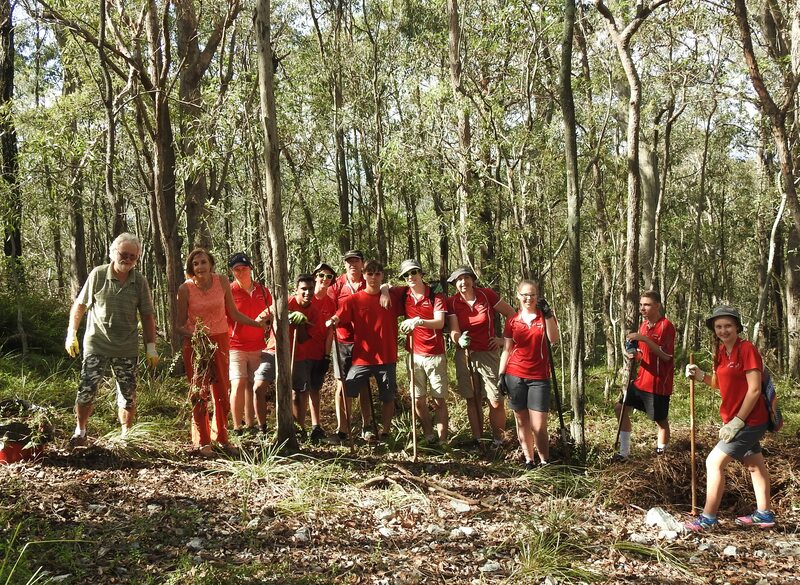 The track leads through the Gertrude Petty Place Bushcare site where a group led by Sue Jones has been removing weeds and restoring native grasses, vines and trees. 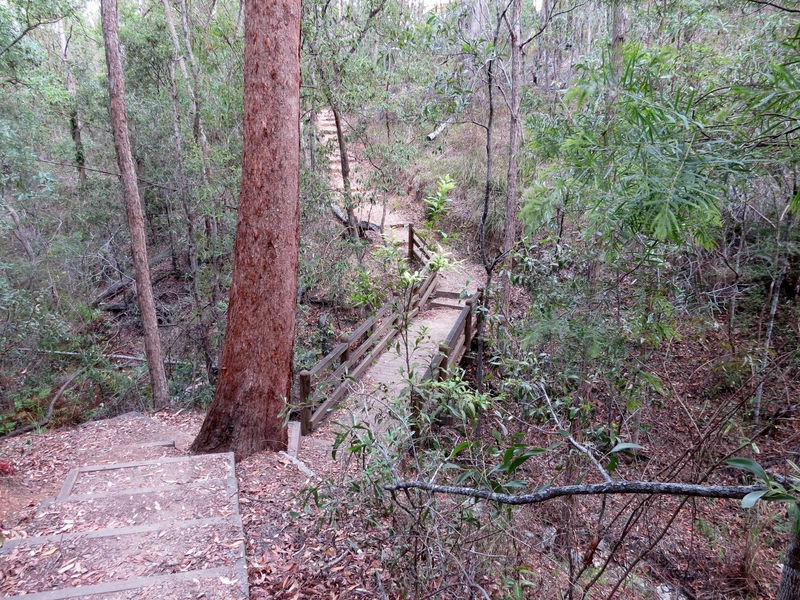 The section of the Federation Track through to the junction with Ironbark Track is very easy walking with no steps or steep climbs. 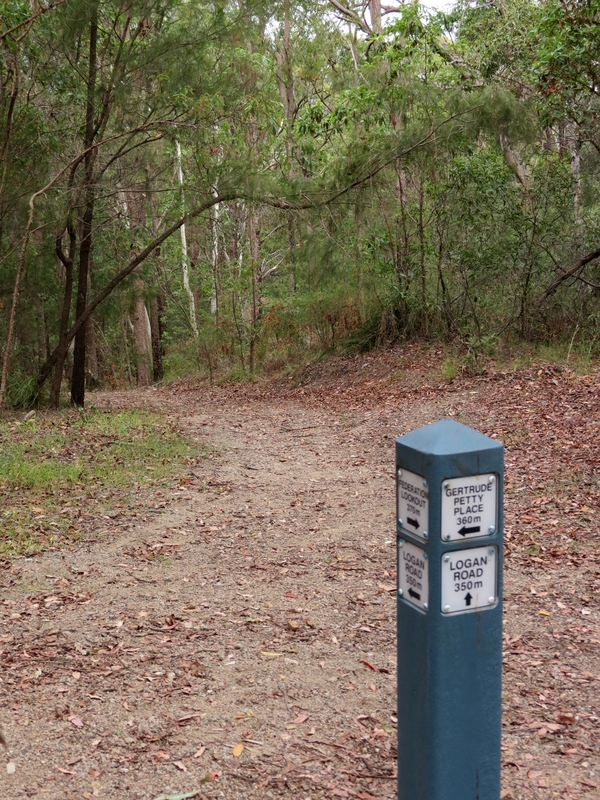 The Ironbark Track currently connects through to Logan Road via the Hillsong Carpark off Rover Street. 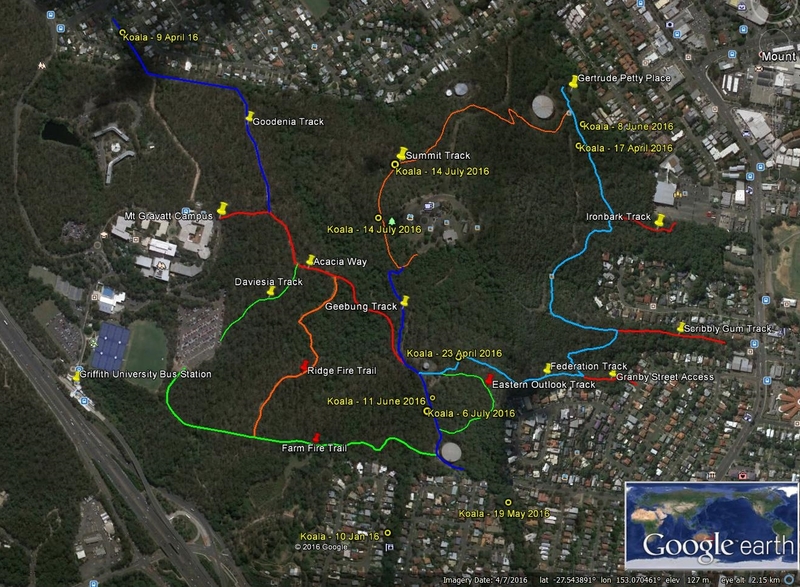 The long term plan is to bridge the gully at the Rover Street Bushcare site creating a wheelchair accessible track from Gertrude Petty Place through to Mt Gravatt Showgrounds. 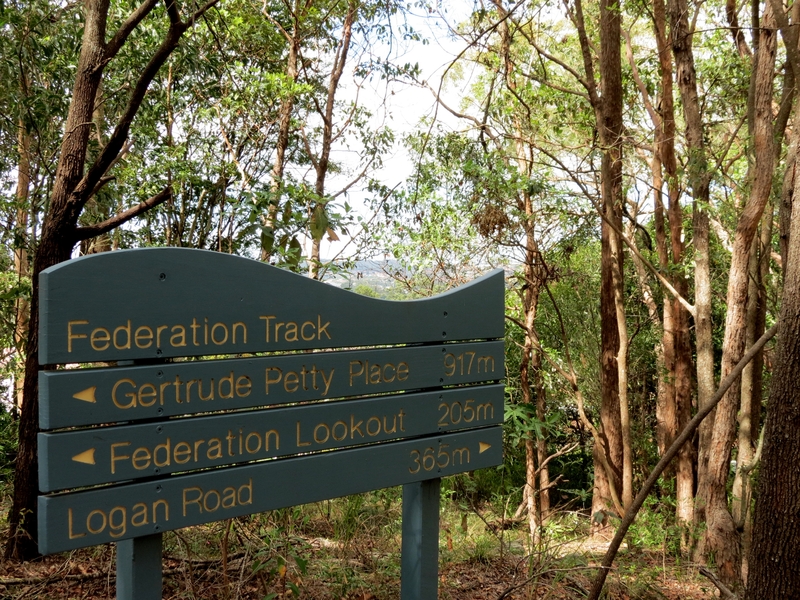 From the Ironbark Track junction the track starts climbing to reach Federation Lookout. 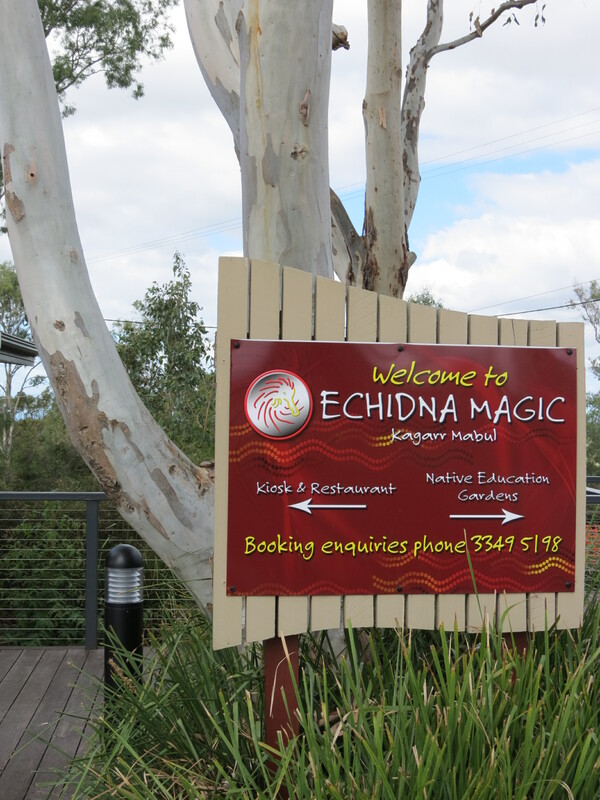 A short side track to the right takes you Federation Lookout with excellent views over the city to the east..
From Federation Lookout the track goes downhill over grey-white quartzite. 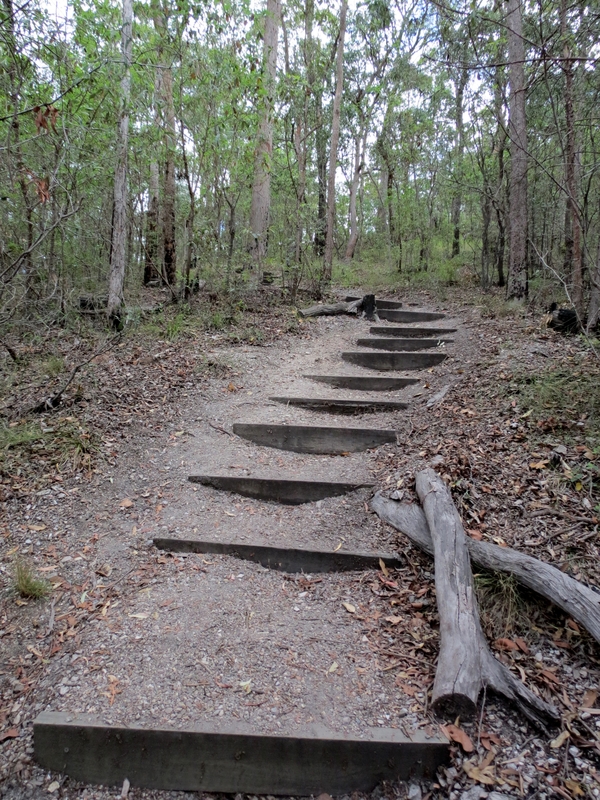 Large quartzite rocks scattered beside the track create some interesting photographic opportunities. 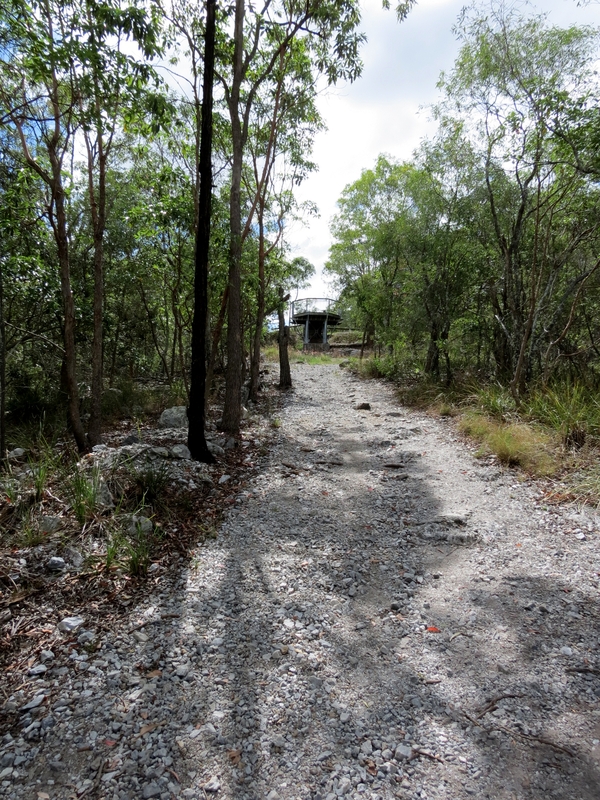 The Scribbly Gum Track links through to Logan Road at the old Scout Hut opposite Wishart Road. 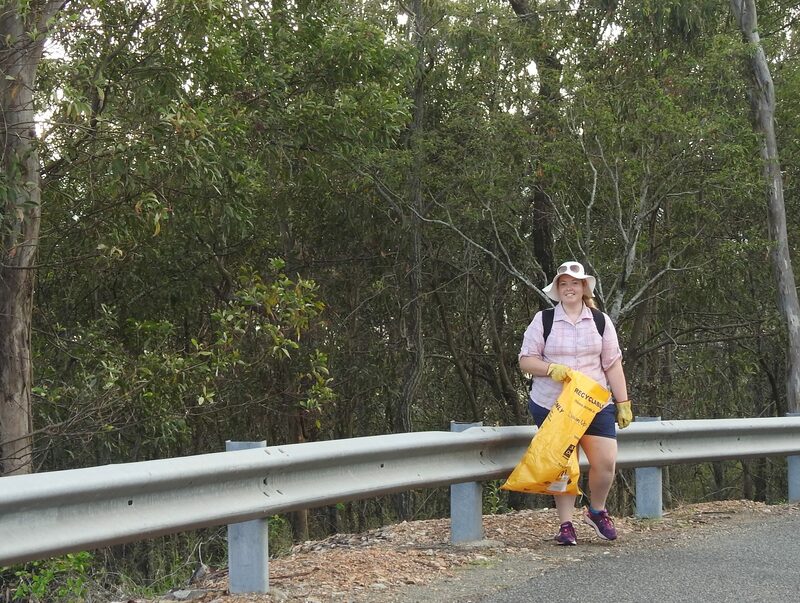 You can park at the Scout Hut to walk directly to Federation Lookout. 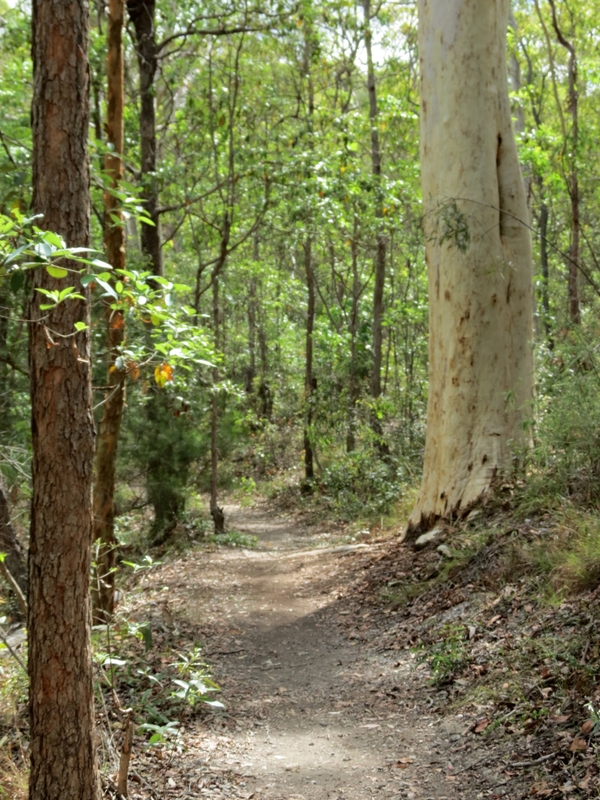 The walk is quite interesting as it crosses Jo’s Creek before climbing towards the lookout..
From the junction the track winds though Scribbly Gums Eucalyptus racemosa one of our iconic Australian trees that look like someone has been scribbling on the bark. 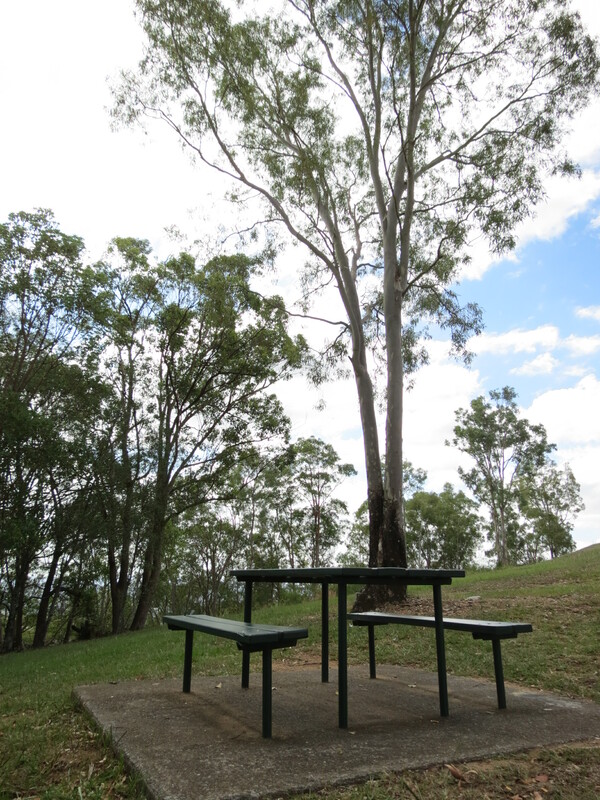 “That can’t be scribbling, it is right up there metres above ground.” The scribbling is the work of moth larvae feeding on photosynthetic tissue just below the epidermal cells in the tree trunk. 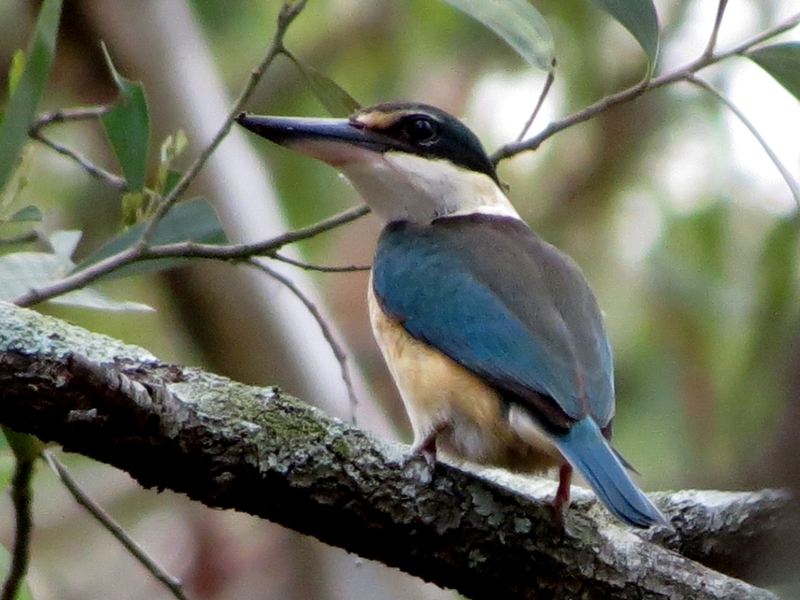 Pause on the timber bridge crossing Jo’s Creek and watch for small forest birds.. The Granby Street Track leads to Logan Road via Granby Street. 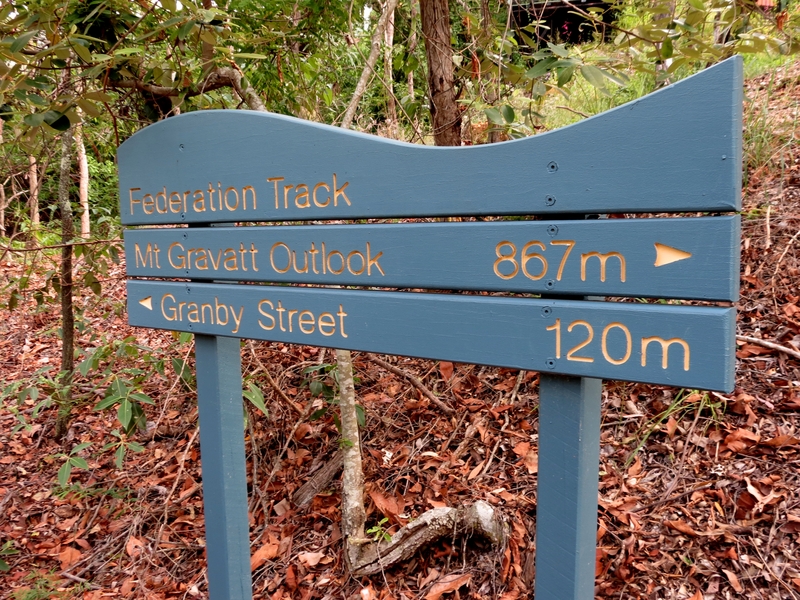 The track to Mt Gravatt Outlook is a solid climb gaining 55 metres in height over half a kilometre. 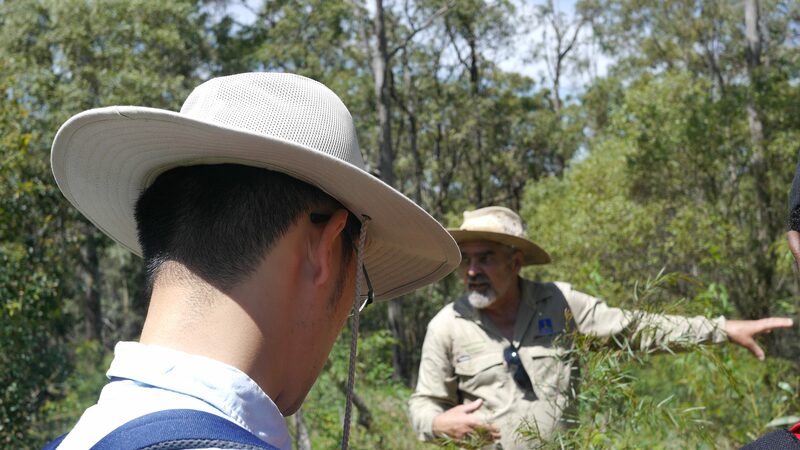 I stopped where the Federation Track joined the Geebung Track to check restoration work on the degraded weedy area beside the track. 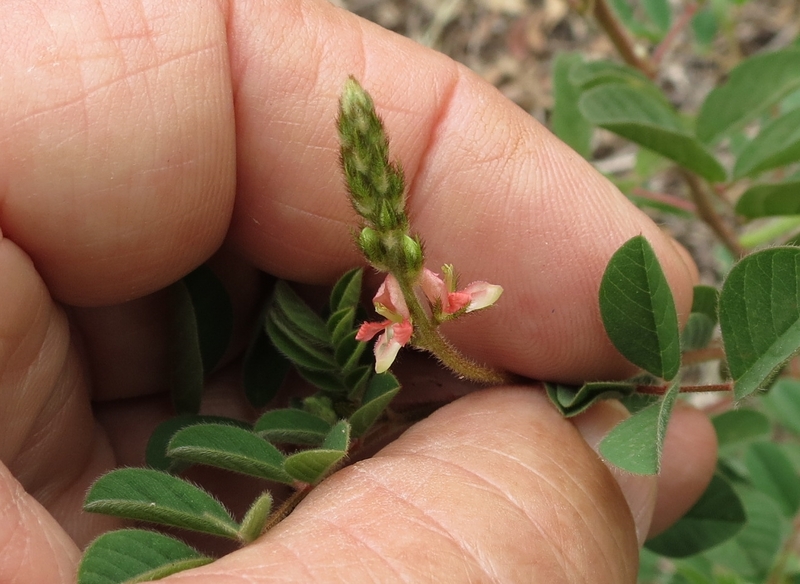 I am always pleasantly surprised at the resilience of our native flora and fauna species that hang on despite massive disruption by man and weed invasion. Among the metre high Guinea Grass Panicum maximum v maximum, Cobblers Pegs Bidens pilosa and Red Natal Grass Melinis repens, I found Slender Flat-sedge Cyperus gracilis, Creeping Beard Grass Oplismenus aemulus, Scrambling Lily Geitonoplesium cymosum and a healthy stand of Hairy Indigo Indigofera hirsuta an attractive native shrub which is caterpillar food plant for the Long-tailed Pea-blue and Common Grass-blue butterflies. 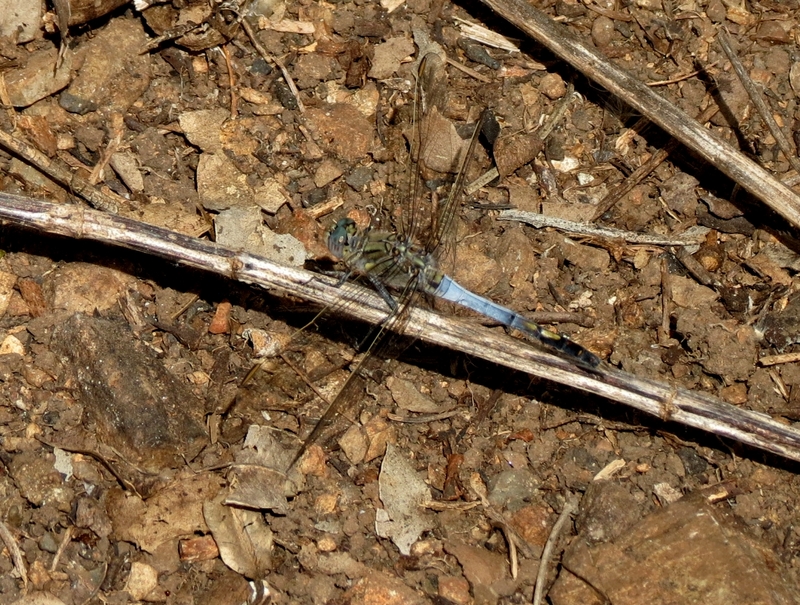 I also spotted a Blue Skimmer Dragonfly Orthetrum caledonicum resting in the sun. 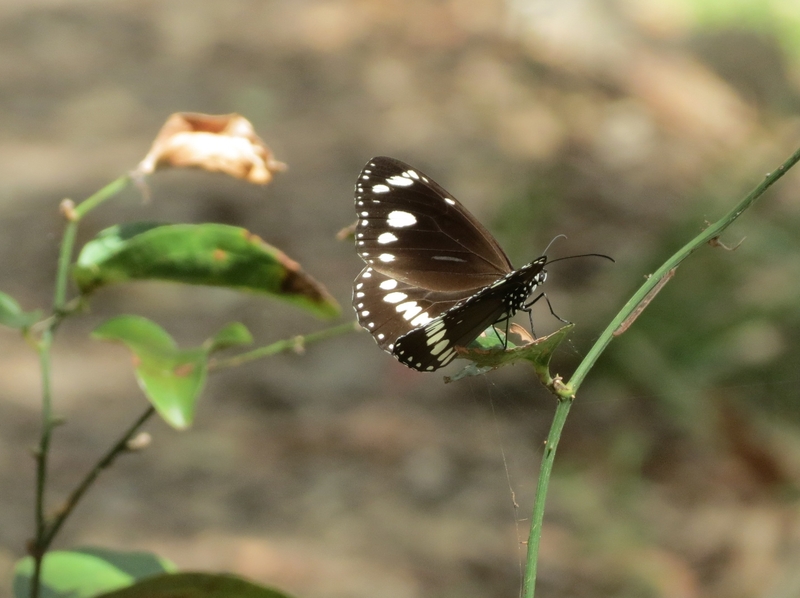 Following the Geebung Track to the Mt Gravatt Lookout I came across a number of Common Crow Euploea core butterflies performing mating flights. 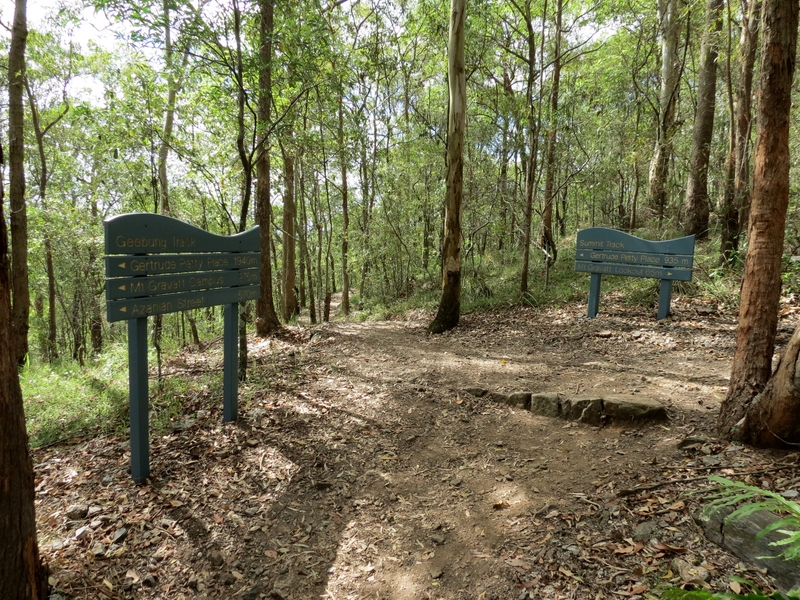 The Geebung Track joins the Summit Track just short of the Lookout picnic area. 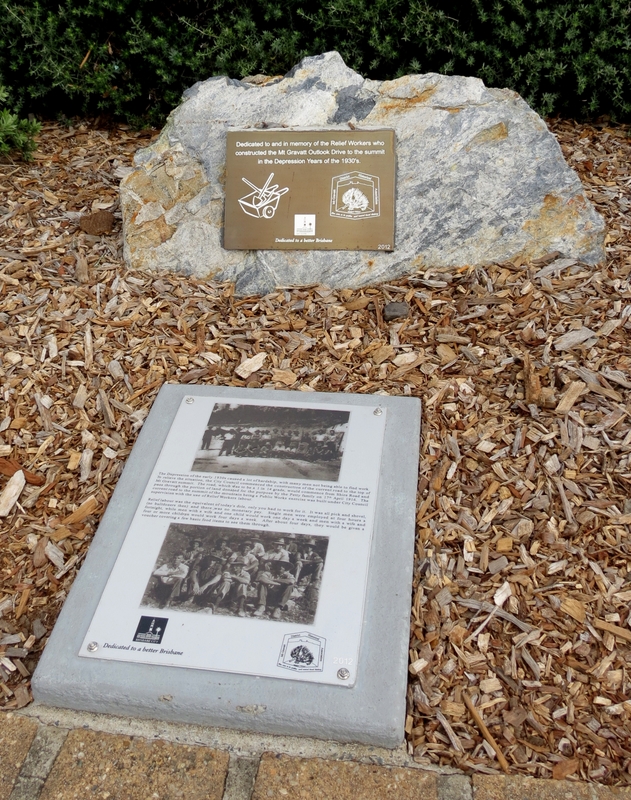 or learn some local history. 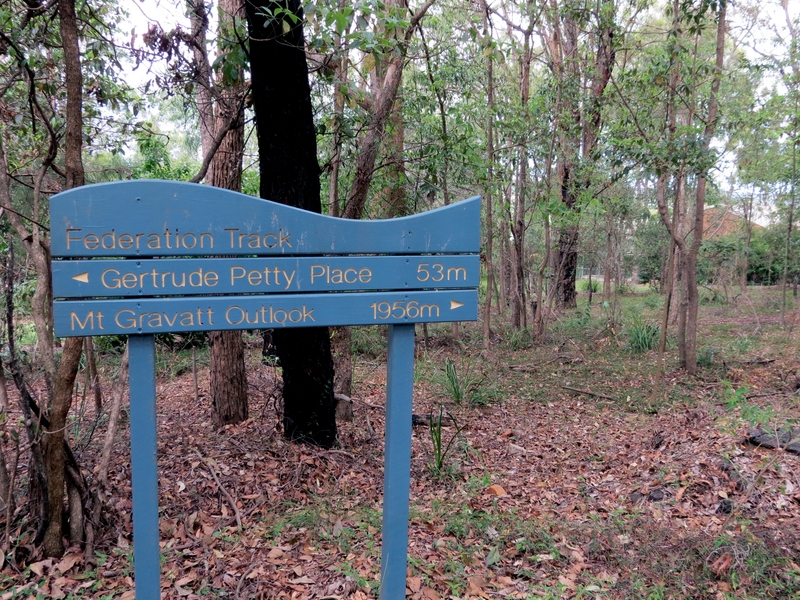 After refilling my water bottle I returned to Gertrude Petty Place via the Summit Track which winds around the northern face of the mountain.